Mount Mercy Coach Aaron Jennings likes his team's chances when they need a clutch 3-pointer to win a ballgame in the final second. Bailey Basala drilled a 3-pointer with 5-tenths of a second remaining Monday night to snap a 90-90 tie and give the Mustangs a dramatic 93-90 victory over St. Ambrose in a non-conference game at the Hennessey Recreation Center. Antwain Strong found Basala with a perfect pass with a few seconds left and the 6-foot-5 sophomore from Moline, Ill., let it fly with perfect rhythm and touch. "Antwain was driving to the hoop. I knew he was going to find me," said Basala. "He always does. Always." Mount Mercy, which leads the NAIA in 3-point shooting, made 18 against St. Ambrose, matching the second-most in school history. The Mustangs broke the school record when they made 22 against Viterbo in the season opener this year. Jennings uses a version of the "Princeton Offense" that he learned while playing for Bill Carmody at Northwestern. It stresses ball movement, back-door cuts and open shots on the perimeter. College basketball is faster now and more wide-open than when Jennings played at Northwestern, and he's tweaked the "Princeton Offense" so his players can let it rip. "I've always been more of an offensive coach than a defensive coach, because I was a better offensive player than a defensive player," he said. "We've kind of adjusted it to the new college game. "It's all about sharing the basketball and we talk all the time about assists. When we're sharing the basketball and moving it so well, we're tough to beat." Strong, who ranks fourth in the country in assists, had eight Monday. All told, the Mustangs collected 23 assists on 31 field goals. "That's awesome," said Jennings. "That's how we play." The Mustangs sizzled from 3-point range, hitting 18 of 33 for 54.5 percent. Dennis McKinney and Mychael Brawner-Henley made four 3-pointers. Mohammed Alabagami hit three triples, while Basala, Christian Reischauer and Emilio Villagrana had two apiece. Mike Evans made one 3-pointer. Basala, a transfer from Lewis University, loves playing for the Mustangs in their wide-open attack. "It's my favorite offense," he said. "My favorite thing is shooting the 3's. Shoot as many as you can." Basala never hesitated when Strong found him on the perimeter on the right side of the basket. "Honestly, it just felt like another '3' to me," he said. "I've shot so many of them, it didn't feel any different. It felt great. It knew it was in." St. Ambrose (7-2) was also hot from 3-point range, sinking 14 of 22 for 63.6 percent. Strong snapped an 88-88 tie with two free throws with 41 seconds remaining to give the Mustangs a 90-88 advantage, but Warren Allen scored for the Bees with 16 seconds left for a 90-90 deadlock. Jennings did not call a timeout, trusting Strong to find a shooter with the game on the line. "You have a lot of trust in your players and you have high expectations for your players," said Jennings. "And then when you see them succeed, it's very rewarding. You're proud for your team, and you're proud for them." The clock showed all zeroes after Basala's game-winning shot, but the officials put 5-tenths of a second on the scoreboard to give the Bees a final chance. Basala deflected the in-bounds pass to end the game. Mount Mercy finished a tough stretch Monday night, with four games in eight days. 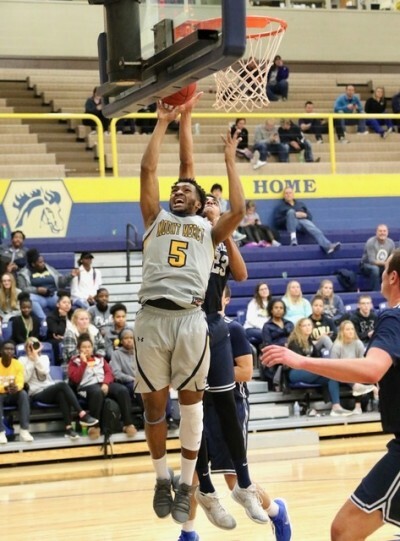 They beat Culver-Stockton, 115-91, last Monday, then defeated Graceland, the defending NAIA national champions, 85-77 this past Thursday at home. The Mustangs had a 5 1/2-hour bus ride to Kansas on Friday and dropped a tough game at Baker, 83-81, Saturday afternoon. 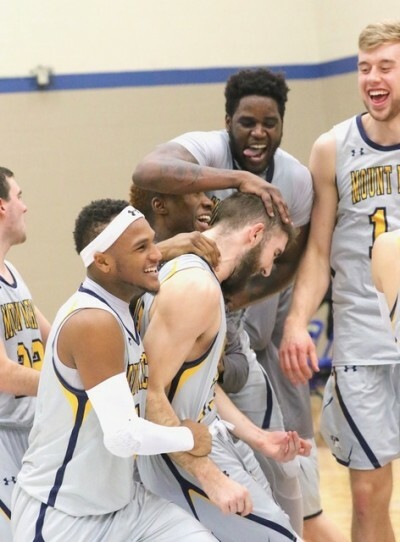 They rode the bus for another 5 1/2 hours and looked fresh in the big victory over St. Ambrose, avenging a 75-74 loss to the Bees in Davenport on Nov. 7. "We were ready to go," said Jennings. "It's exciting to see." McKinney led Mount Mercy with 23 points and seven rebounds. Brawner-Henley finished with 19 points, six assists and five rebounds. Albagami scored 11 points. Allen led St. Ambrose with 23 points. Mount Mercy makes another trip to Kansas later this week for a game at MidAmerica Nazarene on Saturday. ST. AMBROSE (90): Williams 3 0-0 9, Kerr 4 2-2 10, Allen 9 5-10 23, Kaczmarek 4 0-0 12, Meeske 5 5-8 18, Schols 3 0-0 8, Portwood 2 0-0 5, Kazanecki 2 0-0 5. Totals 32 12-20 90. MOUNT MERCY (93): McKinney 9 1-1 23, Brawner-Henley 7 1-2 19, Evans 2 2-2 7, Strong 1 7-7 9, Villagrana 2 1-2 7, Doe 0 0-0 0, Hehmann 0 0-0 0, Albagami 4 0-3 11, Reischauer 3 0-0 8, Johnson 1 0-0 2, Stoeffler 0 0-0 0, Kehinde 0 1-2 1, Basala 2 0-0 6. Totals 31 13-19 93. Halftime - Mount Mercy 47, St. Ambrose 42. 3-point goals - St. Ambrose 14 (Kaczmarek 4, Williams 3, Meeske 3, Schols 2, Portwood 1, Kazanecki 1), Mount Mercy 18 (McKinney 4, Brawner-Henley 4, Albagami 3, Basala 2, Villagrana 2, Reischauer 2, Evans 1).